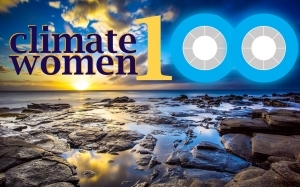 Welcome to Hub Culture's first listing of 100 women leading the climate conversation across science, business, government and academia, part of our ongoing Ordinary Club of Extraordinary Women. The list comes on the heels of COP23, where the dreaded "manel" of all white, male panels provoked social media conversation about the lack of women in vocal conversation on climate change topics. These women from around the world are at the forefront of the response to climate initiatives and hold a bedrock of knowledge relative to progress on the issue. List compiled with special thanks to Executive Editor Edie Lush, Jess Southall and the Sun Valley Institute's Aimee Christensen, whose Facebook post on the topic inspired the research. Many of the women in this conversation can be reached via their Twitter handle, included here for an easy follow, and handy for those planning extraordinary future panels related to climate solutions. Do you have an addition to the list? Tell @Zeke_ai or @hubculture on Twitter to add someone for future consideration.